Well, the long and short of it is, my spring veggies did AMAZING and my summer veggies have been okay at best, terrible at worst. Here’s how things are looking, and a harvest report. All that’s left in this garden are carrots (right), peppers (middle) and one parsley plant. I moved these peppers because they were doing so poorly. I have a few small fruits, but the plants are tiny. Transplanting so late seems to have stunted their growth. Lesson learned: if something is struggling, best to leave it where it is. I would have been better served by fertilizing (9-59-8) and adding egg shells more often. 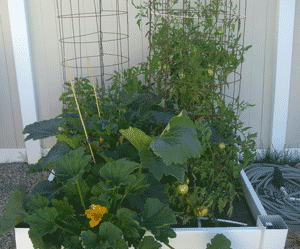 This garden bed has cucumbers on the left trellis, cherry tomatoes on the right. The tomatoes have gotten a little out of control, but so far they are the ONLY tomatoes I’ve harvested at all, so I don’t mind. I’ve picked probably 8 medium to HUGE (whoops!) cucumbers, and we’ve loved eating them sliced with some salt. I’ve tried pickles in the past, and the truth is we never eat them. So this year I’m focusing on eating as much fresh from the garden as possible. 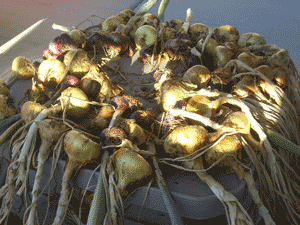 Once most of the onion tops fell over, I tipped the rest and let them sit in the ground for a week. Then I put them outside in the shade for another week. Here they are ready to be trimmed up and stored for the fall. I cut off the tops and the roots, brush off the dirt and then store in a cool, dry, dark place. Someone gave me the tip to store in nylons–drop in an onion, tie a knot, add another onion, knot, until it’s full to the top. When you need one, just snip off the onion at the end. This keeps them dry and separate. Since I can’t remember the last time I actually wore nylons, I’ll have to get some cheap at Wal-Mart. I harvested 25 pounds of onions from 12 squares. 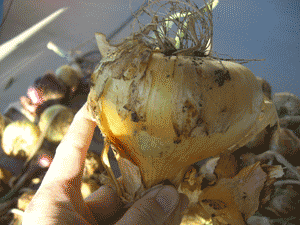 My yellow onions did FANTASTIC–here you can see the biggest one I grew. Fertilizing at 6″ and 12″ made a huge difference! My onions were much bigger this year. For some reason nearly all my red onions grew stalks and started flowering. They ended up being smaller and not as good as the yellow onions. Oh well, I’ll have to use them right away! Here are my potatoes. As you can see, I’ve pulled a few stems and started digging for our dinner! This means I won’t have a very accurate count on how much we’ve harvested, but we love eating these straight from the garden. Can you blame me? I can tell the potato season is almost over because the leaves are starting to yellow and fall over. They used to be lush and green and flowering. Here you see the saddest tomatoes ever. I have three tomato plants: the Roma on the back left is so tiny, but it does have a few fruits. Last year my Roma’s got as big as the plants on the right! 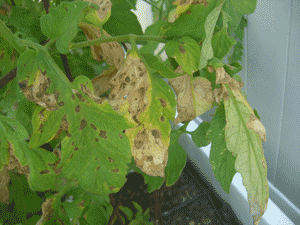 I think this might be a nutrient deficiency, because they are all sort of small and yellow. I just added egg-shell water and 9-59-8. We’ll see if these perk up at all. I should have caught this earlier, but at least it is treatable with anti-fungal spray. The zucchini have been off again on again, failure and success. I got two huge fruits early in the season, then I pruned them. I think it must have shocked the plant because I didn’t get zucchini for a while. Now the plant is back to a pretty big size, and producing zucchini every 4 days or so. I have 4 just sitting on my counter! This sad looking garden contains 5 pepper plants. The plants have finally recovered from the cool, wet spring and are nice and big. There are a few fruits, but not much to speak of. I’ve just fertilized these as well, so we’ll see how they do. 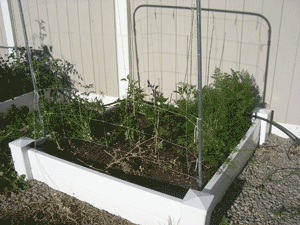 I moved several pepper plants from this garden, and in the right four squares I had green beans. Those were a smashing success: I got 5-6 pounds of beans from 4 squares! We ate them nearly every night with a little butter and salt. YUM! Now these tomatoes (4 of them) are my only hope for redeeming the summer veggies. They are relatively big and have bunches of fruit on them. I’m hoping to scrape at least one batch of salsa from these. Lesson learned: Plant more tomatoes next year. My family just can’t live without home made salsa! I thought I was the only one having problems in my garden with the bad weather this summer. Emily-Your plants are looking great overall. It’s been a difficult summer for a lot of gardeners. Suzanne-I garden in Florida. 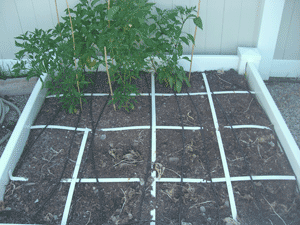 Many people here place black plastic over the garden bed for 6 weeks to take care of the nematode problem. Then, when you’re ready to plant at the end of August/beginning of September, you should be good to go! Babs–great to hear your update! 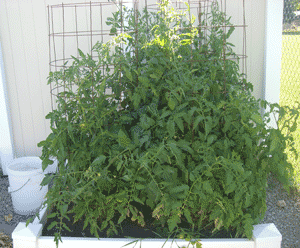 The tomato ripening problem is not new–some advice I’ve had is to reduce watering to once a week. I’ve just started this, and we’ll see how it goes! Hi Emily: I have followed your site since early spring and have learned a lot from you, thanks. We also had a long and cool spring. We had a fairly good garden considering it’s our first. In it we tried almost everything and are happy with what we grew. However, there is some concern about the tomatoes. We have a good amount of them but they are not turning color! Our temperatures are finally in the low 90 degrees but we have not had any triple digits so the nights are not warm. Just wanted to share. Babs from Southern Oregon. Suzanne–I found this document about nematodes in case it might be helpful. I don’t think a barrier would be sufficient–only because I had two layers of weed mat in my garden and still have TONS of earthworms. I know nematodes are a different type of “worm,” but I imagine they could work their way through a simple barrier. 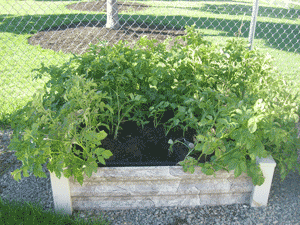 The article says container gardening is a solution–so putting a bottom on it and raising it up would probably work. The other thing that sounded promising is soil solarization–putting clear plastic over your garden beds in the heat of the summer for several weeks, which “bakes” the nematodes and kills them. As for the wood, if everything rots or gets eaten . . . cedar is a great choice of natural wood that withstands a lot of challenges, but it is quite a bit more expensive. “They” say not to use pressure treated, but I’ve also read that today’s pressure treated wood is much safer than in the past. If you are going to use it, perhaps do put a barrier between it and the soil? I don’t know enough to say whether linseed oil is sufficient. The other way to think of it–if you use cheap wood and need to replace it often, maybe that’s the same price as investing in more expensive wood? Or you could consider vinyl? I used sets (mini-dry onions) and starts (someone else started them from seed) and had good luck with both. Since you have such nice weather there, you might try seeds. I think it would be a neat experiment to do one square of each! Your garden looks wonderful. I want to start a sq. ft. garden this fall in Florida. I’ve been searching the internet, unsuccessfully, trying to find the answer to a couple questions. Maybe you can help me decide the best approach. I want to avoid the nematode problem we have here. Do you think I should put a plywood bottom on the 4×4 frame and set it up on blocks to keep it off the ground or would a barrier of some sort be sufficient, such as plastic or landscape cloth? I can see that this method of gardening is expensive at first as it is necessary to purchase the soil, but I plan to use it for years to come, so I want to do it right the first time. Secondly, what about the wood to use? I will be using 2x10x4 ft. long boards, but what about type of wood? Everything here rots so quickly or termites eat it, so I should use pressure treated but I don’t want chemicals leaching into my food crops. YellaWood claims to be the least hazardous, but doesn’t say it is 100% safe. 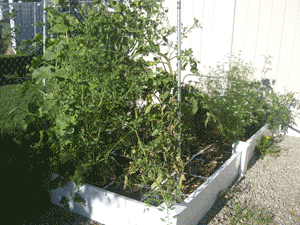 They do have a building plan for a raised garden on their website. I read on a blog from S. Africa to use 2 coats of linseed oil to preserve the wood, what do you think about that? Any input you may have would be greatly appreciated. Hey Emily! Love your garden and hearing about both your successes and failures. We all learn from it! Did you start your onions from seeds or from sets? I’m trying to figure out what the best option will be for me once things cool off around here (North FL). Thanks! !